Back at Oka Wati's after lunch, we were just hanging out on our balcony when we heard the sound of gongs in the distance. A gamelan! Grabbing our cameras we rushed down the stairs, and out towards the alley that led to the main street, thinking that the procession must be coming down Monkey Forest Road. To our surprise and delight, the procession had turned off the main street and was headed down the alleyway right towards us! I had to jump into the bushes to give them room to pass right by us. 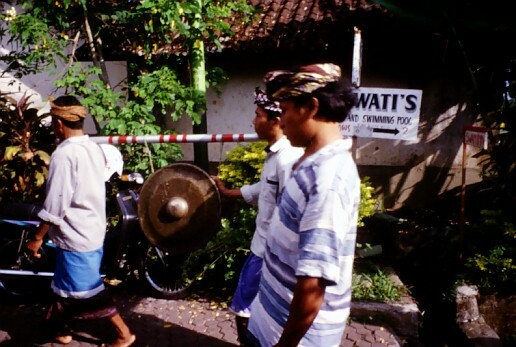 Only our second day in Bali, and a real gamelan marches right past our front door! It was the first marching gamelan or beleganjur we'd ever seen, but it was clearly related to the sitting gamelan we were used to, with gongs, drums, metal pots and cymbals, playing complex, syncopated patterns that were completely mesmerizing. 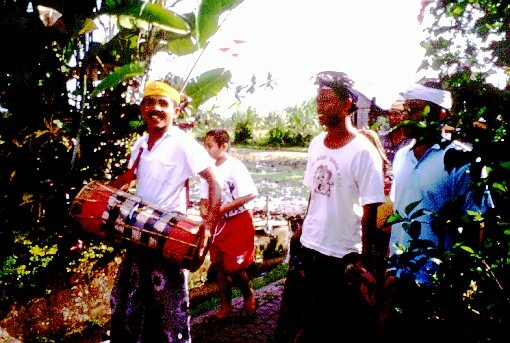 We followed the gamelan down the alleyway and past the end of our ricefield to a little hut, where they wound down their piece and brought it to a halt. This was obviously the end of the procession. Evidently it had been one of the ceremonies associated with a cremation that had taken place the previous day, consecrating the holy water that would be used in the ceremony the next day, in which the ashes would be taken to the sea and released into the waters. 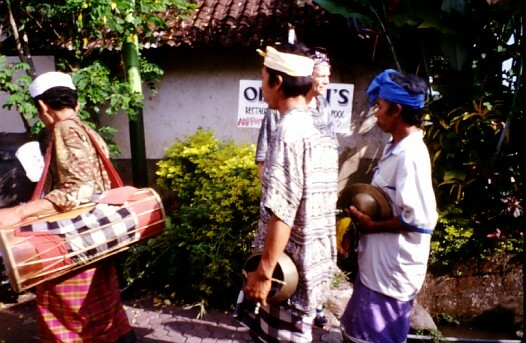 Seeing this beleganjur, and several others during our stay in Bali, inspired us to buy our own set of beleganjur instruments for our own group in California. 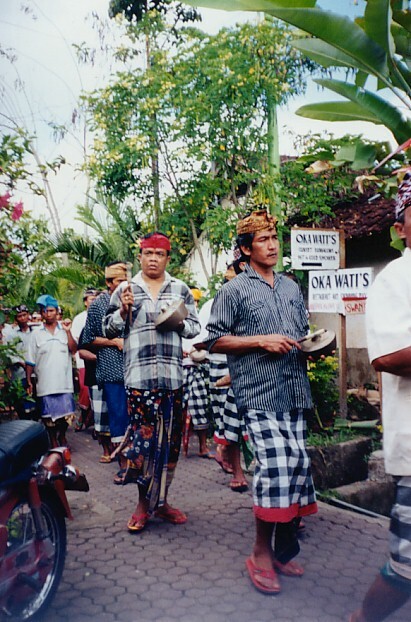 We now play marching gamelan processions fairly regularly, both with the UCSC gamelan Swarasanti, as well as with our community gamelan Anak Swarasanti.